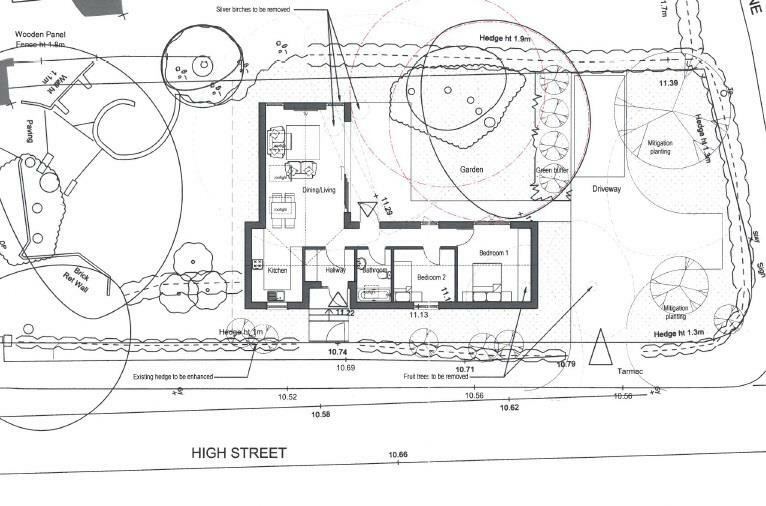 A residential building plot with full Planning Permission granted for the erection of a two bedroom bungalow. The plot occupies a substantial frontage within the very pretty village of Brant Broughton located 8 miles from Newark on the Lincolnshire Nottinghamshire borders. The site is located within the village Conservation Area and comprises a rectangular corner plot between High Street and Swans Lane. The High Street character is formed with a variety of historic cottages and houses with some more modern complementary dwellings. The bungalow design is contemporary in character with accommodation including a hallway, open plan dining living and kitchen areas, two bedrooms and a bathroom. There is vehicular access proposes, turning and parking space. The village of Brant Broughton is situated 8 miles east of Newark close to the Nottinghamshire and Lincolnshire border. This pretty and genuinely unspoilt village has a variety of brick and stone built properties. The spire of the parish church St. Helen's is noted by Nikolaus Pevsner in his book the buildings of England as one of the most elegant in Lincolnshire. The building plot situated on the High Street is adjacent to a cottage and a variety of stone built properties. The village also has a primary school and public house. Communications in the area are excellent with the A1 and A46 trunk roads crossing at Newark. Many commute from the village to Lincoln, Grantham, Nottingham and Newark. Fast trains from Grantham to London Kings Cross are capable of journey times in just over 65 minutes. Town & Country Planning - Planning Permission is granted by North Kesteven District Council under reference: 17/1233/FUL for the erection of a two bedroom bungalow. The conditional planning consent is dated 1st November 2017 and the development must be begun no late than the expiration of 3 years from the date of the permission. A copy of the Planning Permission and the approved plans together with documentation can be obtained Richard Watkinson & Partners or online: https://www.n-kesteven.gov.uk/residents/planning-and-building/planning/planning-applications/planning-online/. Services - We understand that water supply to the adjoining property Spring Cottage runs under the plot and any existing service easements will exist. Tenure - The land is freehold.